He will join the baddies in the supernatural thriller. Colors is all set to launch Naagin 3 on 2nd June. Well, we expect nothing less from this season as well, considering how the previous two seasons were constantly at No.1 in the TRPs lists. And the makers are also not leaving anything to chance here. Ekta has been roping in the best of the industry talent to make Naagin 3 better than the previous season. While Ekta has most of her casting in place, we hear that the latest to join the list is The latest buzz is that Ekta has roped in Puneet Chouksey to play one of the bad guys. Puneet was last seen in Star Plus' popular drama Saath Nibhana Saathiya where he played the role of Karan, Amar Upadhyay's character Dharam's business friend. We contacted Puneet who confirmed the news to us, but also refused to divulge the details. 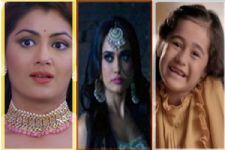 Naagin 3 will have Karishma Tanna, Anita Hassanandani and Surbhi playing the naagins, with Pearl V Puri playing the male lead. The show will also see the return of Rajat Tokas to the series. Celebs lauds Manoj Bajpayee for Dadasaheb Phalke award!